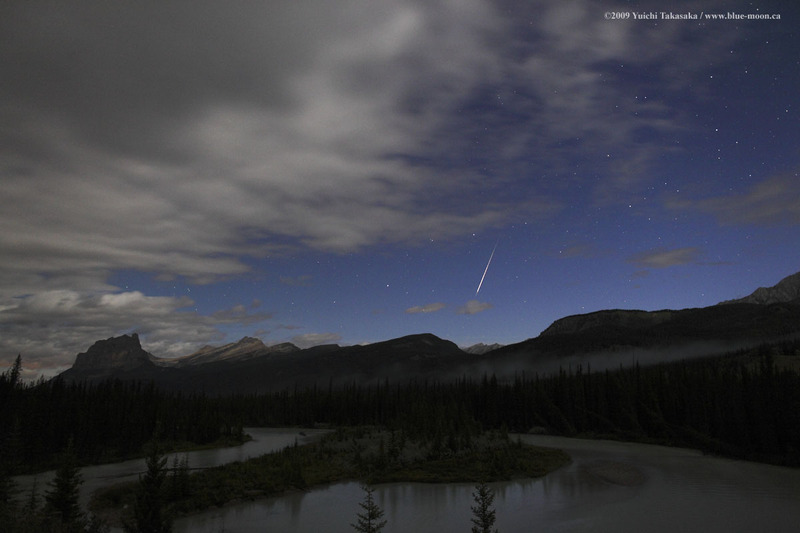 Most of British Columbia was cloudy and/or rainy so I decided to drive to Alberta to watch Perseids. It was cloudy when I arrived to Banff National Park, but the sky opened up some part of the night. This image was taken at 04:36 Mountain Time. 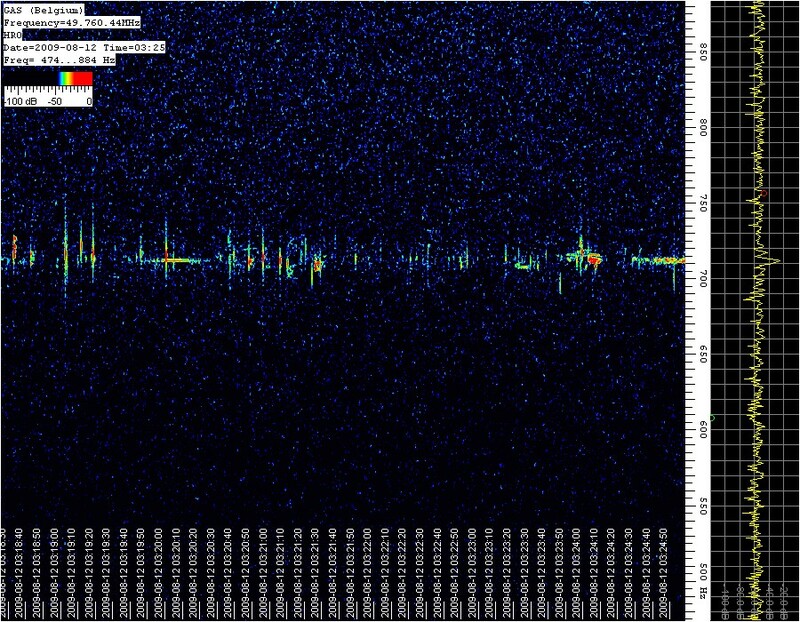 We saw only a few meteors during the night August 11-12, but we could "hear" a lot of them (about 4 per minute - image1) thanks to the Groupe Astronomie de Spa (Belgium) Yagi antenna, listening to a distant Russian TV channel at 49.76 Mhz. 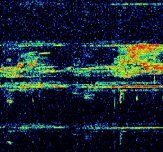 The echoes are produced when the TV signal is bouncing off the meteor's ionized tail and is then captured by the antenna. 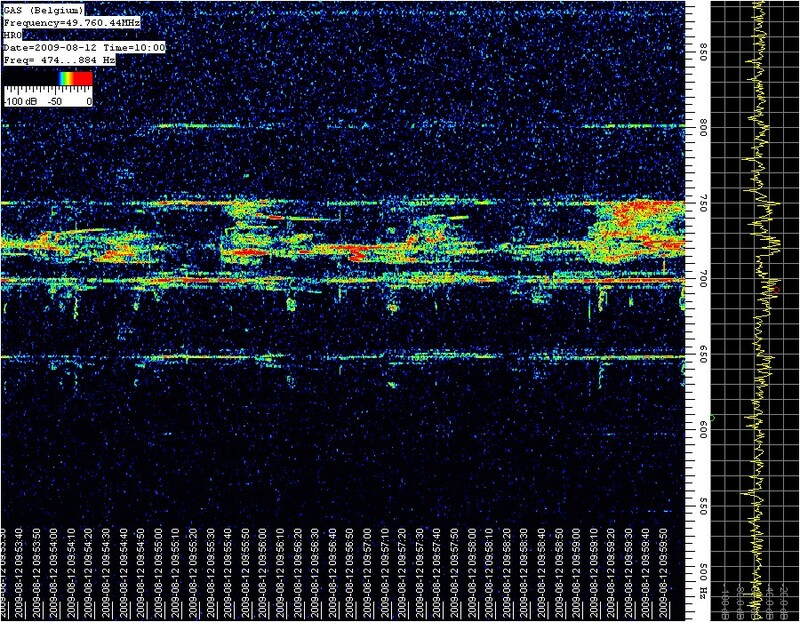 This image is a computer jpeg record (using SpectrumLab software) of the meteor signals (short vertical streaks) in frequency space spanning 5 minutes around 01:22UT August 12. 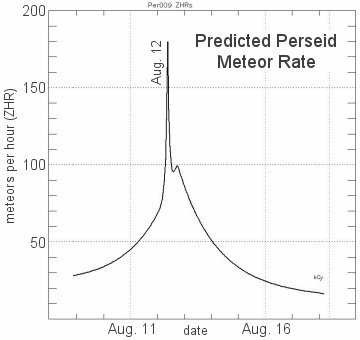 The 2d image is a similar record around 07:57 UT August 12 when the number of very strong meteors (overdense meteors as "big blobs") suddenly increased (from ~1 bright every 5 minutes to ~1 per minute) for about 45 minutes. The California Sierra Nevada Mountains just south of Lake Tahoe at the 7,500 foot elevation. 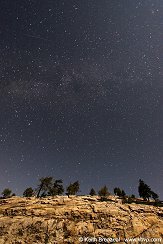 High in the California Sierra Nevada Mountains the sky is spectacular. 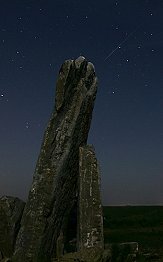 Even with the moonlight, the Perseids were visible to the north. 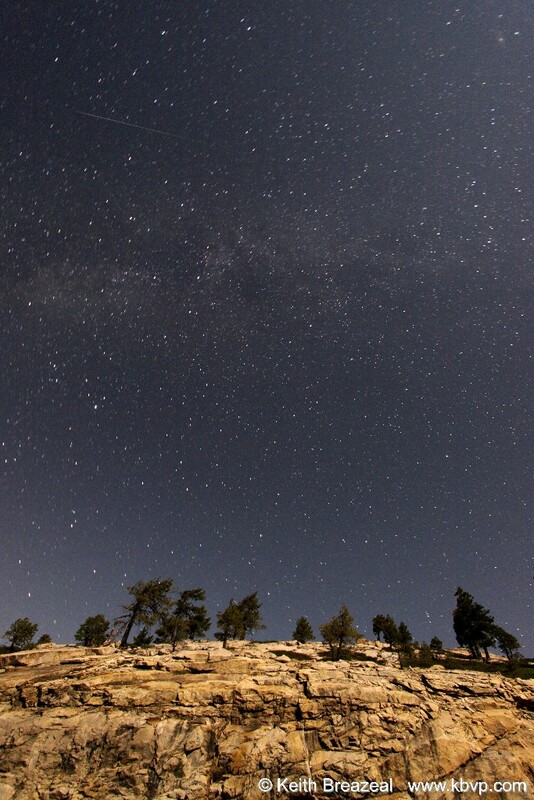 In this super wide field photo, the Milky Way provides a dramatic backdrop for the Perseids. 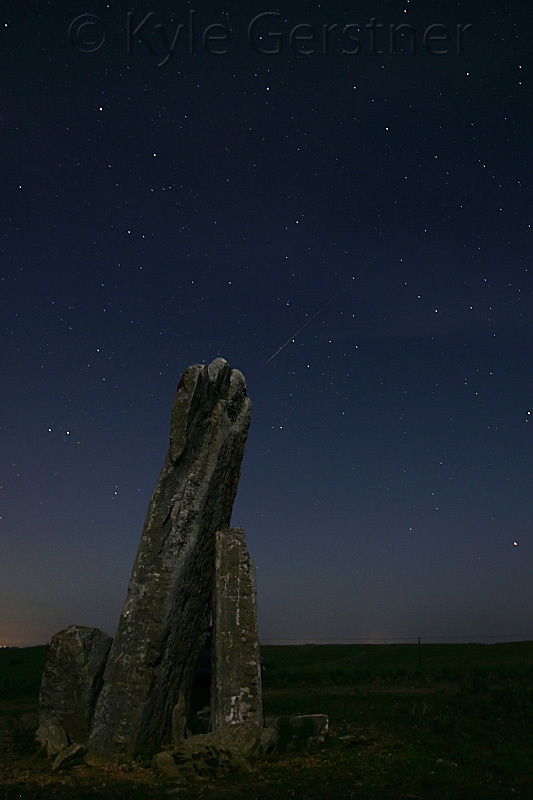 This 90 second exposure captures the landscape as if were daylight and brings out the beautiful night sky. 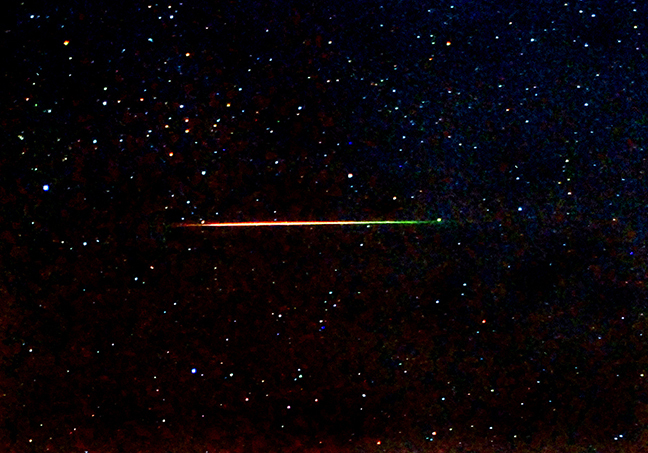 The Perseid in this photo was one of the nights best and brightest displays. Photo details: 2:03 am MDT, August 12. 30 sec. exposure, ISO 800, f/4. Teter rock in the Flint Hills of Kansas. Taken with a Canon Mark 2 with a 16/35mm 2.8f lens at 16mm 2.8F, shutter 25 seconds ISO 400. 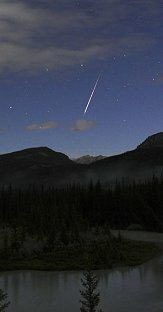 I saw around 15 meteors overnight. Would have seen more if I wasn't fiddling with the camera so. much.